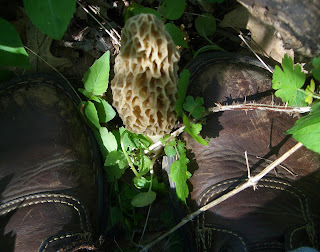 When I first spot a morel my heart does a little dance and then I stand very still and look away from it. I look away in search of others in the area before I rush to the scene. Here is a picture of where I was standing when I spotted a morel a few yards away. Enchiladas with morels. (Well, only the four in the back have morels because 2.5/5 of the family won't eat them.) P will eat them in very small quantity. 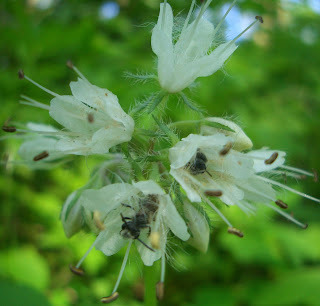 I took bunches of pictures while I was in the woods. I liked this one the best. 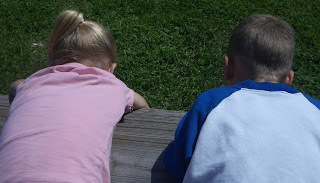 While at M and P's soccer game yesterday, S and his "girlfriend" M o were just hanging out on the bleachers having one of those 3 year old conversations. This was even cuter in person because the dog was resting her chin on S's sock. Do dogs have chins? happy monday to you.....i cannot resist commenting on your circa 1997 sonoma? boots in the top picture. i trust you only wear them to morel hunt...lol. 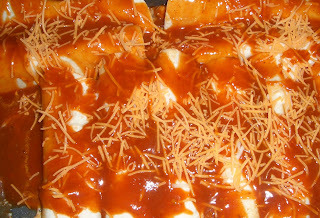 the enchiladas look delicious. beautiful pictures once again........no i dont believe that dogs have chins, they have muzzles. 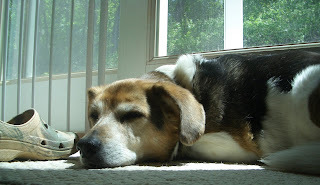 resting in the "sunspot" ahhhhhhhhhhh. Actually they are Born boots www.bornshoes.com and I did purchase them in THIS millennium. A dog might ask, 'Do you think that humans have muzzles?' A pig... 'Do you think that humans have snouts?' Elephants... 'Do humans have trunks? You see the humor in asking if dogs have chins? This is called anthropomorphism and it reflects an anthropocentric worldview. Very true, dc nick - the anthropomorphism is in the statement that "the dog was resting her chin on S's sock" and not in the question. Still, very humorous to me. centria- We get quite a few in our area (northestern Illinois) depending on the weather. I found about 29 good sized ones in 90 minutes. I mix chicken in with the morels and then fill the enchiladas. Mmmm.